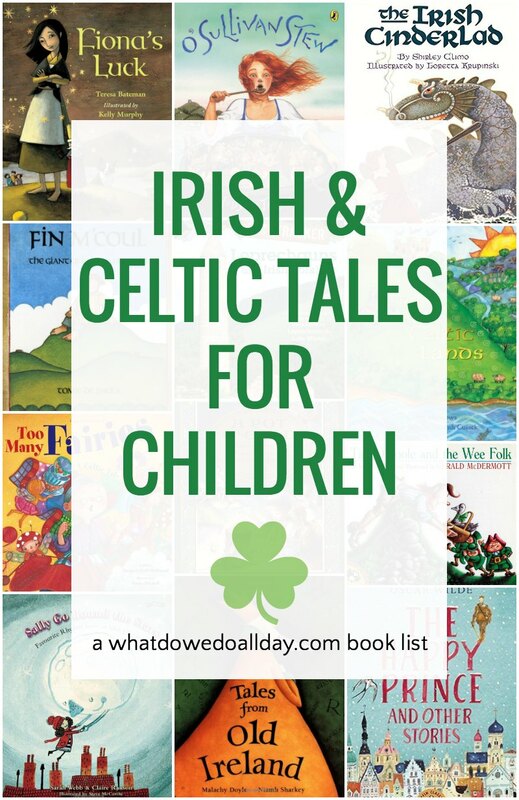 It doesn’t need to be St. Patrick’s Day in order to read Irish folktales to your kids! 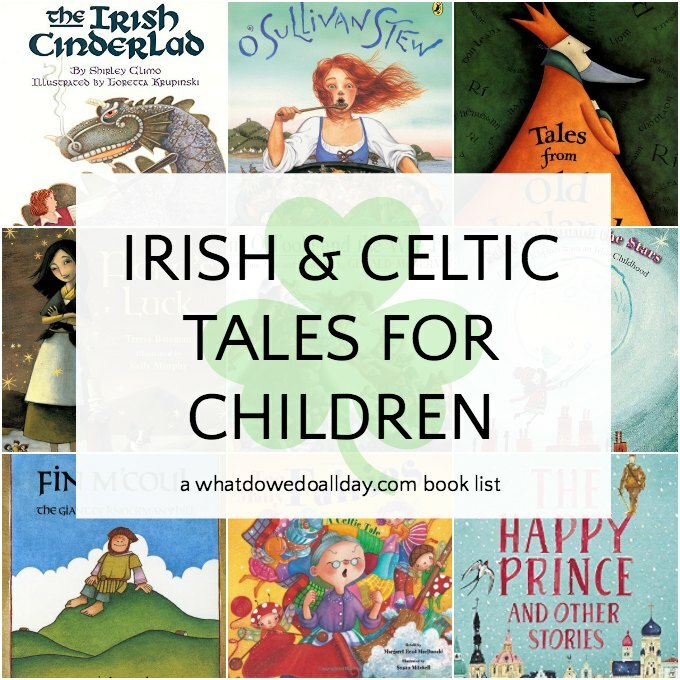 As part of my world folktale picture book series, this book list of Celtic mythology, Irish legends and folk lore will introduce your children to the legends of that fair green isle. Too Many Fairies: A Celtic Tale. My 4 year old is loving this tale from master storyteller, Margaret Read MacDonald. When a little old lady grumbles over her chores a group of fairies come to relieve her, but they do not turn out to be as much help as they promise! The narrative contains some lovely repetitive devices that encourage listeners to interact with the story and I love that the moral of the tale is don’t complain about your housework! Fiona’s Luck by Teresa Bateman. Fiona is a clever, witty heroine who makes her own luck instead of relying on magic. She outsmarts the Leprechaun King who has locked all the luck in Ireland away in a chest. I particularly like the illustrations. O’Sullivan Stew by Hudson Talbott. Kate’s village has been put under a curse by the witch of Crookhaven! Not to worry, this feisty, imaginative and clever Irish heroine manages to rescues them all with her smart, surprising and very humorous storytelling skills. Tim O’Toole and the Wee Folk. Folklorist Gerald McDermott may be best known for his Anansi the Spider tale, but he’s also written this entertaining European folktale. Poor Tim is shunned by his neighbors but when he gets a magic gift he lets the McGoons trick him out of it. Fortunately, there is a group of leprechauns to help him change his fortune. The Irish Cinderlad by Shirley Climo. In this Irish folktale version of Cinderella, an Irish lad with enormous feet runs away from his step family in order to slay dragons, giants and magical bulls! But after he rescues a princess he leaves behind one of his huge boots. Will the princess ever find him? Kids familiar with the classic Cinderella tale will love this Irish fairy tale. Fin M’Coul: The Giant of Knockmany Hill. Tomie dePaola has several wonderful picture books that draw upon Irish legends and folklore such as Jamie O’Rourke and the Big Potato, but I will highlight only one here and you can get the rest from your library to round out your St. Patrick’s Day book collection! When Fin the giant hears the fiercest giant in all the land is coming to fight him, he runs to his wife who concocts a clever plan. A tale full of gigantic humor. Tales from Old Ireland (with CD) by Malachy Doyle. I looked at a number of story collections for this list, but many of them had illustrations which were too scary for my kids. That was not the case with this Barefoot Books publication which also comes with 2 CDs. This is the second year we have checked it out from the library and we were sad again that one disc was missing because the boys loved listening to the tales. If you have an Audible subscription you can listen to the stories for free (! ), if not, you can sign up for the Audible trial and listen for free. Sally Go Round The Stars: Favourite Rhymes from an Irish Childhood by Claire Ranson & Sarah Webb. For younger kids, I really love the illustrations in this book of Irish nursery rhymes. Most of the selections are familiar even to non-Irish children but others, like the one with a cat named Pangur Bán will be new. Tales from Celtic Lands by Caitlin Matthews. A collection of Celtic mythology, not only from Ireland, but also from Scotland, Wales and Brittany, and another good choice if you want to avoid scarey illustrations. It also comes with 2 CDs. I love collections which come with audio files because generally my kids want me to read these thick books straight through! A Pot o’ Gold: A Treasury of Irish Stories, Poetry, Folklore, and (of Course) Blarney by Kathleen Krull. I like that this Irish folktales anthology contains not just stories, but poems, historical facts, recipes, Irish blessings, etc. etc. I could go on. It’s also heavily illustrated. The Happy Prince and Other Stories. Did you know Irish playwright Oscar Wilde also wrote tales for children? Younger children will certainly not understand much of the social commentary and satire in these stories and protective parents may wish to delay reading them until their children are older but whatever you decide, the stories will get conversations started, and that is always a good thing. Project Gutenberg has several versions with illustrations available for free so you can preview it and decide if they are right for you. If you are looking for St. Patrick’s Day activities to go along with your reading, I recommend the ideas over at No Time for Flash Cards! I had no idea that Oscar Wilde had written fairy tales. I’m looking forward to reading those. You always have such great suggestions. I’m always buzzing with ideas after reading your blog and looking forward to new books to read with my son. Thanks, the Wilde fairy tales are probably more entertaining for adults and older children, but we need some good reads, too! I love Tales of Old Ireland. Fiona’s Luck is a HUGE favorite in this house. My oldest still keeps her copy by her bed on her favorites shelf. We also checked an audio version out from the library, and the narrator had the most beautiful Irish accent. Teresa Bateman has written a few more books based on Irish folklore. The illustrations vary, but the stories are always charming. I didn’t know there was an audio version of FIona’s Luck. Thanks for sharing that. I haven’t heard of any of these, but I was just thinking I needed to get some St. Patrick’s books from the library. Perfect timing! I just now put most of them on hold. Love the collection of titles! Speaking as a teacher, it’s so helpful when a blogger does the “leg work” and collects and reviews books on a theme or a genre. BTW, found your site on the Hop this week. So glad I did! Please swing by and see me at well at http://howtoteachanovel.blogspot.com or http://teachwithpicturebooks.blogspot.com. I’m so glad you were able to put together this list! We really enjoyed the Magic Tree House books in our house, but interestingly, after reading the first 20 or so, the kids kind of lost interest in Jack and Annie. Ah, St. Patrick’s Day, I have fuzzy memories of St. Patrick’s Day from my college days, but it’s not really something we celebrate fully. Although we have been known to make green pancakes and dress in green! I agree that all the Magic Tree House books do run together, fortunately I don’t have to read them aloud anymore. LOL. The kids like them, though. I don’t have too much Irish heritage, but living in New York, St. Patrick’s Day is huge here so we like to jump on the bandwagon. I would love for you to link up activities like this that teach children about other languages and cultures at my weekly link-up “Say it Two Ways Thursdays”. Link up at http://toddlefast.blogspot.com/search/label/Say It Two Ways Thursdays. Wow, this list is amazing! I can really tell how much work you put into putting this together. I’m Irish on my dad’s side so I was SO EXCITED to see this. Thanks! What a great list! I much prefer these kinds of books for St. Patrick’s day that have something interesting in them then just a St. Patrick’s Day book that just is a quasi book to celebrate the holiday. Stopping by on the Kid Lit Blog Hop. What a great list. Just requested Fiona’s Luck from the library after reading your list. Thanks. I hope you get a chance to read and enjoy some of them. I realize that Brave was not about the Irish, but I bet that interest in that wonderful movie will cause many children to want to read more about that section of the world. Thanks for linking into the Kid Lit Blog Hop! It’s set in Scotland, I think? There is a Celtic tradition there. I haven’t seen the movie, though. As an Irish reader I wanted to compliment you on a great list! I love Oscar Wilde’s fairy tales – the writing is so beautiful and it is a wonderful way of introducing younger readers to his work. Thank you so much Maeve. I’m so glad I was approved by someone who knows what they’re talking about! I love this list. We had such a hard time finding good books for St. Patrick’s Day last year. You’ve hooked us up for this year!! yeah! Thanks, Jackie. I found that I didn’t like a lot of the St. Pat’s day picture books unless they were specifically connected to folklore. Great list. We have a couple on our “to read” list for St Patrick’s Day. I might still add Fiona’s Luck if I can find it in the library. I love this collection! Do you mind if I post the picture and your site link on my page? I publish local events and activities for families. Thank you! Thank you for your kind words, Kiley! You may link of course. It’s fine if you want to use the image. Thank you! I will share your site with my readers. I’m a book worm, too, so I will be following you now! Hi! I’m co-hosting Mom’s Library with True Aim this week and I featured your list at Ready-Set-Read! with my St. Patrick’s day round up from ideas shared at Mom’s library last week. I didn’t even know there were that many cute books about St. Patty’s day, printing this list and taking it to the library with us! Thank you so much for sharing! Not to be “that guy”, but it’s St. Paddy’s Day. It may sound nitpicky, but many find it very irksome as Patty is a woman’s name and not a nickname for Patrick in Ireland. Calling a Patrick Patty is kind of an insult. I just requested several of these. I think Emma will especially enjoy “Fiona’s Luck”! Too Many Fairies is one of our favorites! We had so much fun setting up a “stage” and acting out the parts! As a kid my favorites were Great Folk Tales of Old Ireland by Mary McGarry and Irish Fairy Tales by Joseph Jacobs. And, of course, the movie The Secret of Roan Inish (unfortunately the book that it’s based on, The Secret of Ron Mor Skerry is out of print and way too expensive, and doesn’t take place in Ireland anyway). As an Irish American Mythology/Religion major, I have a love/hate relationship with St. Patrick’s Day. I’m all for celebrating Irish culture, learning Irish history/myths, or recognizing the struggles/triumphs/stories of Irish Americans, but I HATE all of the leprechaun kitsch, blatant inaccuracies, and general misinformation. Making something green does not make it Irish. Celtic =/= Irish, Irish =/= red hair, corned beef and cabbage is not Irish food, and the Irish language is not Gaelic. Not to mention that the Republic of Ireland and Northern Ireland are different and the Republic of Ireland is not part of the UK. Ugh, it makes me so mad and it’s everywhere. I guess you could say it really gets my Irish up… Anyway, if you’re interested, I have a list of other great Irish reads (though less kid-oriented) on my blog’s St. Patrick post from last year (http://boundandgaggedbooks.wordpress.com/2013/03/17/dead-tongues-tell-no-tales/). Thank you for sharing your favorites! I am hoping you might know the name of a children’s book that I am looking for–it is about a boy who delivers a noisy package that turns out to be a set of bagpipes. I cannot remember the title or the author and haven’t had any luck finding it in our library catalog or online. Any chance you are familiar with this book? Thanks! p.s. I really appreciate your book recommendations!